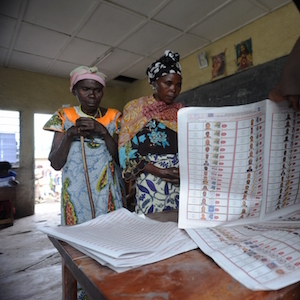 In mid January, the Independent National Electoral Commission (CENI) of the Democratic Republic of the Congo announced that it would need 18 months to update the voters’ roll. This was followed by an announcement from the minister of interior that a new electoral law, and several others related to the elections, would first have to be tabled during Parliament’s next session, starting in March. These two timelines are the most concrete indicators of what many have long suspected: that the Congolese government does not intend to stick to constitutional deadlines which mandate that the presidential election take place in November this year, and that it is now firmly pursuing its strategy of ‘glissement’ (French for ‘sliding’) – an indefinite delay of elections. The opposition and civil society have cried foul, but the reality is now slowly setting in that the November deadline will come and go, and that presidential elections will not take place. By design or by default, the CENI has made very little progress on even the most basic preparations for any of the elections – local, provincial and presidential – which it intends to hold during this election cycle. It’s one thing to accept a slight delay, recognising that elections in the DRC are costly and complicated. It is quite another to leave unchallenged the lengthy and open-ended process that the CENI and the Congolese government have now set in motion. In Kinshasa the talk is now of a ‘technical delay’, a term that allows the ruling party and the presidency to be distanced from the process and counter the impression that the hold-up is politically motivated. Corneille Nangaa, the president of the CENI, has been on every local TV and radio station explaining the technical process. When it comes to a constitutional crisis prompted by a delayed presidential poll, the government has a ready-made answer: Article 70 of the Constitution, which states that the president remains in office until he is replaced by another elected president. But few are buying it; and nor should they. By various accounts, the CENI had already prepared a call for tenders for the voter registration process in October 2015, and attributed it to a Belgian company. The CENI now declared that it had nothing to do with that tender process, saying that it is void and has launched a new one. There is also the fact that in the 2006 and the 2011 election cycles, the CENI was able to accomplish this same process in six to eight months. What underpins this extended period this time around if not the lack of political will to move forward as quickly as possible? Between the voter registration delay and the fact that the president has yet to declare that he will not run for a third term, uncertainty about the country’s political future is running high. The International community and key powers like the United Kingdom, Belgium, Germany and the United States have been vocal about the need to respect the constitution, as have the United Nations (UN), the African Union (AU) and the European Union. But so far no one has commented specifically on the 18-month voter registration process. This creates the risk that the government will feel it has found an acceptable loophole. One way to engage with this issue would be for the international community to assist in accelerating the registration process, by offering additional resources or a provider who can complete the work as close as possible to the November election deadline. This would also allow for more transparency, and could stave off the further delays that one might expect were the CENI to go it alone. Another contentious issue in the convoluted election landscape is dialogue. Last year, Kabila announced that he was convening a political dialogue to discuss the electoral calendar. The political opposition and civil society rejected this initiative, like its many predecessors, because it was perceived as yet another stage-managed event. Opposition parties have also rejected it on the grounds that it legitimises the government’s strategy of orchestrating a delay in the election calendar. Both of those arguments are legitimate, but with statements like the one made recently by UN Secretary-General Ban Ki-Moon and others, it is clear that the international community wants some sort of dialogue between political parties to reach consensus on the way forward. After UN Special Envoy to the Great Lakes, Said Djinnit’s inconclusive visit to Kinshasa in November 2015 to explore his possible role as mediator, the task now seems to have fallen to the AU’s Edem Kodjo, who was put in charge of leading the mediation in January. The UN had offered to assist, and the fact that nothing came of Djinnit’s visit could indicate that Kabila was not willing to accept the UN’s requirement that the process be independent. Although a number of opposition parties refused to engage with him, Kodjo’s first visit to the DRC was a mitigated success. Rightly or wrongly, there is a perception that he is simply picking up the initiative for a national dialogue where the Congolese government left off, rather than starting afresh and making his own assessment of what is necessary. If the AU wants Kodjo to play the role of a neutral facilitator in the Congolese political situation, he should publically make it clear that he is not associated with the government’s initiative and that he will be leading a new, independent process between political parties; not between the president and political parties. If he does not make a clean break, it will be very difficult for the process to have the credibility and buy-in that it needs to make a difference. On the other hand, if Kodjo manages to do this, the political opposition should rise to the occasion and use the opportunity to engage in a constructive dialogue to address its key concerns. Of course, this may not be what the Congolese government wants. But only if Kodjo makes it clear that the dialogue is independent will we be able to gauge whether the ruling party and the president really are committed to finding a compromise solution to the election impasse. What the country needs is clarity on when elections will be held, and what the president intends to do – not more empty justifications and contorted interpretations of the Congolese constitution. The consequences of a prolonged period of uncertainty will likely lead to greater instability. There are already splits in the ruling coalition over the issue of the election and the absence of a successor, and there is growing participation in protest action. How the military and police would react if there are sustained protests in key urban areas is unclear. The signs that things could go badly are all there. If Kabila does not make the right choice, the Congolese population will be looking to the AU, the UN and key countries to make the difference.